When playing the guitar each hand has a different task. We'll describe the way that most right-handed guitarists play. 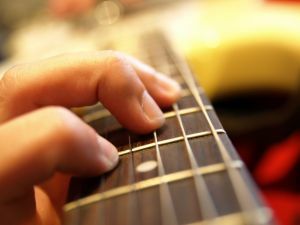 A typical right-hander will strum and pick the strings with their right hand and press the strings to play the notes on the fingerboard with their left hand. The left hand plays the notes on the finger board of the guitar. By pressing a finger down on the string just before a fret, the length of the string that vibrates is shortened to play a note. The left hand can play full chords by pressing down a number of strings while the right hand strums the guitar. The right hand plucks the strings. With classical guitars the guitarist uses their fingernails, but with many modern day guitar styles the guitarist uses a pick. Individual strings can be played or all the strings can be strummed at once together to play a chord. There are also all sorts of picking styles and patterns where a number of strings are played in a repeating pattern. The right hand also sets the rhythm. The left hand may just change between a few chords while the right hand strums in different rhythms to the beat of the song. 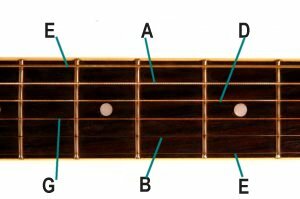 It's a good idea when playing the guitar to know the names of the notes that each string represents. The lowest note is the first E in our list. It's the string closest to at the top of the guitar. It's also called the 6th string. From there each string is in order down the guitar with the first string also being an E. This is the thinnest string, plays the highest pitched notes, and I furthest away from you when you play. When you play a note with your left hand, you press down on the string with the tip of your finger. You press on the string between the frets. Not right on top of the fret, but in the middle area between the frets. If you press just right you should hear a clear note when you pluck the string with your right hand. If you press too soft you will hear a buzzing. This takes some practice at first, but don't get discouraged, with practice it will become much easier. Playing an electric guitar is pretty much just like playing an acoustic. Some people think that playing an electric is slightly easier because the strings are closer together and are often easier to push down. It really just depends on your style of play, but if you can play one, you can play the other. We will be adding more detail on how the guitar is played later. Hopefully with a few fun lessons to get you started.